Tomorrow's People believe everyone should have the chance to build the best life they can, no matter how it started off. They help young people trapped by unemployment to break free, to find and keep a job, and to transform their future. Tomorrow's People has recently completed a re-brand and wanted to support teams to implement the brand nationally. In addition to the standard stationery items, business cards, letter heads, comp slips etc; frontline teams, including its Youth Hubs, also needed to tailor its A4 posters to its region. These are produced regularly to promote local services and required a choice of template to be available, with the ability to personalise some of the areas within the posters. Using our Brand hub system we built an online portal for Tomorrow's People. 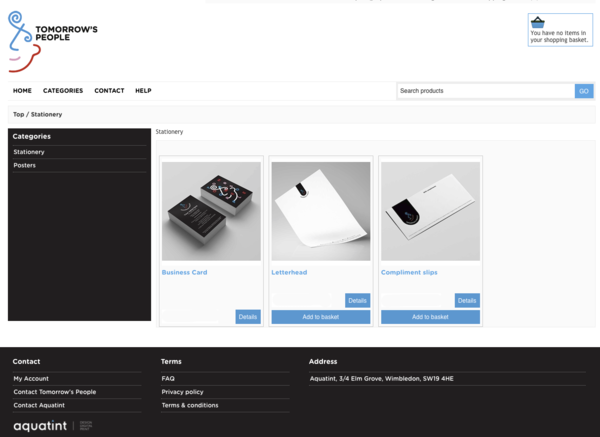 This allows staff to login from any location, and gain access to the required templates; allowing them to build and order all their stationary items online. 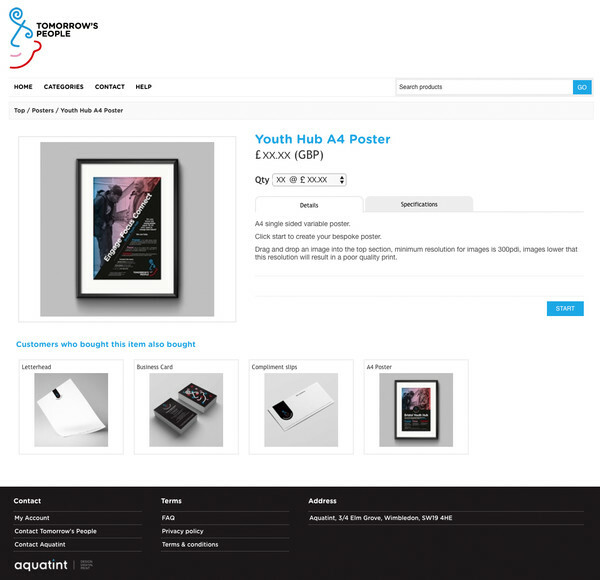 The brand is completely protected by the templates, and means that Tomorrow's People can simply personalise the items on the portal, and submit the orders directly into Aquatints print queue. Tomorrow's People staff are empowered to produce their own materials, instead of relying on head office. The brand integrity is also upheld as the system includes a sign off process to monitor and review all the editable features on the system. Now that Tomorrow's People can complete all their ordering online, it saves them valuable resources in time and money as they do not require in house designers to design and produce artwork. It has been a pleasure working with Tomorrow's People and we thank them for the opportunity to be working on such a worthwhile project.